As 2019 brings harder struggles to all but the wealthy, polls show that healthcare is the number one issue on the minds of American voters, that over 70% of Americans favor Medicare for All, including at least 52% of Republicans. With the 116th Congress now controlled by Democrats in the House, including a freshman class NOT bought by corporate money, we have a realistic chance to move a bill forward. Whatever the next year brings, we must welcome ALL those who are committed to seeing the U.S. provide healthcare - as defined in H.R. 1364 - to everyone residing here. We welcome gratefully the Republicans, members of the FB page Republicans for Single Payer and others. 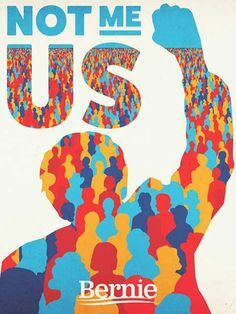 We must be united and relentless in our demand for it, no matter our political affiliation, our physical ability, or the methods we employ to amplify our DEMAND for UNIVERSAL HEALTHCARE! With Joe Biden's announcement of his entry into the cattle call that is the Democratic presidential candidates, he gave us the perfect reason to not wait any longer to endorse Bernie. Sure, Joe is the King of Schmooze (be it a bit "handsy" at times) and establishment Dems have no problem with his acceptance (if not pursuit) of big money donors. C'mon, he's JOE, rode a commuter train every day, lost his wife and daughter, raised his sons, lost one of them, fell in love again with Jill, good ole Joe. But he also correctly said this presidential election will be a "battle for the soul of the nation." And it seems to us that in order to win that battle, we must have the leader with the strongest, deepest, never-waivering soul, so we're endorsing Bernie. It's clear that those in "power " in the Democratic Party are more determined to undermine Bernie and the TRUE Progressives than they are to beat Trump. So let them continue to pay for that mistake if you can stand four more years of Trump. But we have a choice here. If we ALL vote for Bernie in the primaries coming up, it won't matter who has the money and influence of the corrupt DNC behind them. Bernie will be the PEOPLE'S choice! PLEASE don't be complacent about this. Remember, not voting is consent for what we have to continue.And do you really want to keep seeing our country disappear before your eyes?